President Pranab Mukherjee is all set to take on the role of a teacher on the eve of Teachers' Day. He will address around 60 students from Std X to XII of Dr Rajendra Prasad Sarvodaya Vidyalaya, located within the compounds of the Rashtrapati Bhavan. 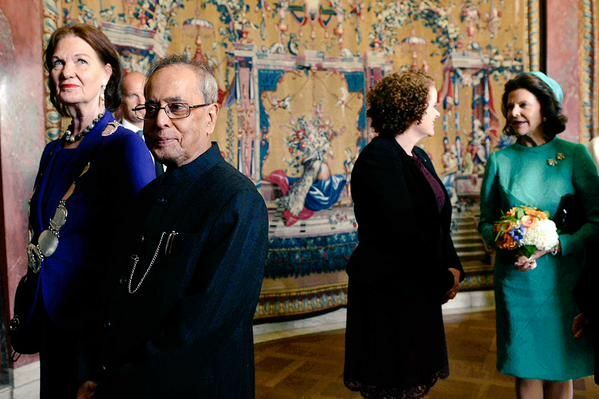 President Mukherjee will conduct lessons in political history. He will also interact with teachers soon after the class. 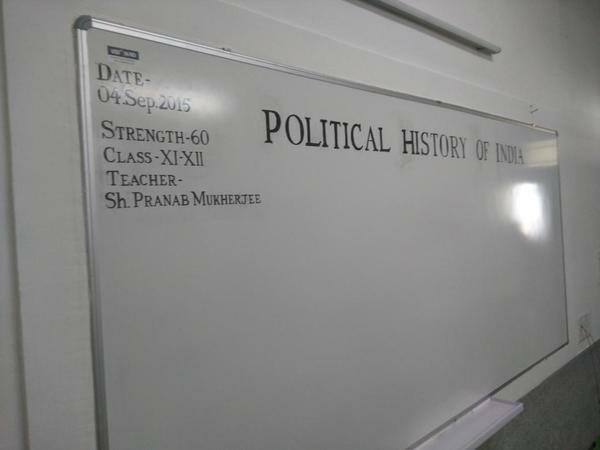 Interestingly, before joining politics in 1969, he was a college teacher. Later, he also tried journalism. He would also be interacting with teachers soon after taking the class. The event is the brainchild of Delhi Chief Minister Arvind Kejriwal and his deputy Manish Sisodia. Kejriwal took to Twitter to talk about why he thinks the President will make a great teacher. 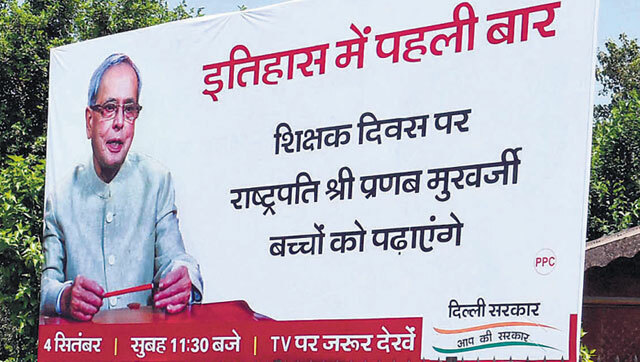 In fact, AAP has been advertising the event through posters and banners across the capital. President Mukherjee, 79, has a Master's Degree in History and Political Science and also Law from the University of Kolkata. Worrying about the quality of education being imparted in his independence day speech, Mukherjee had invoked the importance of "guru-shisya parampara" that India takes pride in. A nation which forgets the idealism of its past loses something vital from its future. Our educational institutions multiply as the aspirations of generations continue to exceed supply. But what has happened to quality, from base to apex? We recall the guru-shishya parampara with legitimate pride; why then have we abandoned the care, devotion and commitment that is at the heart of this relationship? He had termed the teacher a potter and student the clay that needs to be moulded. A guru much like the soft and skilful hands of a potter, moulds the destiny of shishya. The student with devotion and humility acknowledges the debt of the teacher. Society respects and recognizes the merit and scholarship of the teacher. Is that happening in our education system today? Students, teachers and authorities must pause and introspect. The President is a voracious reader and given his understanding of politics and history, this is one class, students certainly don't want to miss. September 5, the birth anniversary of India's second President S Radhakrishnan, is celebrated as Teachers Day. 12:01: President Pranab Mukherjee is now interacting with teachers and students at the Sarvodaya Vidyalaya inside the President' Estate in Delhi. He is talking to them about how the constitution was drafted and adopted. He asks students, "why do you think India took three years to celebrate its republic day after it got independence?" Because we didn't have a Constitution then. 12:10: It took three years to draft the constitution. There were 300 members, elected in a very complicated manner. The first job of the constituent assembly was to elect a president. Constitution starts with - 'We the people of India -' These two words secular and socialist were added through 44th amendment in 1975, he tells students. 12:30: Freedom is not merely the change of white skinned officers to brown skinned officers. So state intervention was mooted. Then we thought of bringing in planned economy and Jawaharlal Nehru's brainchild Planning Commission came into existence. 12:40: I am not a great scholar or a bright student. I am narrating history based on how it unfolded in front of my eyes. Because of democracy a boy from a backward village could reach the Raisina hills. Democracy gives strength to common people to fulfill their aspirations and in post-independent India we have nurtured that democracy. 12:41: Sometime its said our GDP growth is not very high but our rate of domestic savings is very high. 93% of expenses come from India's own pockets. Not from borrowed resources. He also tells students about how former prime ministers PV Narasimha Rao and Manmohan Singh introduced economic reforms in the 90s, something that is being followed till now. 12:45: He talks about Anna Hazare's anti-corruption movement and their agitation for Jan Lokpal Bill. He tells students, Civil society including NGOs, media is the fourth pillar of democracy. 12:50: Twitter, Facebook are powerful platforms of expressing opinion. These are fruits of democracy. He concludes by saying, "it is very important what we learn in the classrooms. It is a permanent learning."